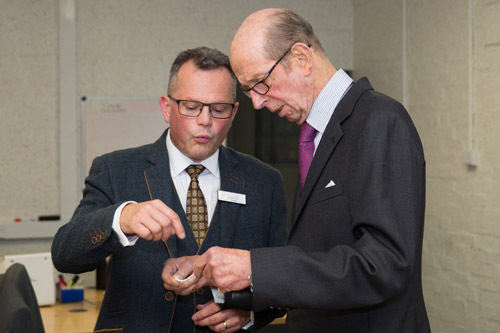 WB The Creative Jewellery Group was delighted to welcome his Royal Highness the Duke of Kent to its manufacturing facility in Birmingham on 21st September. 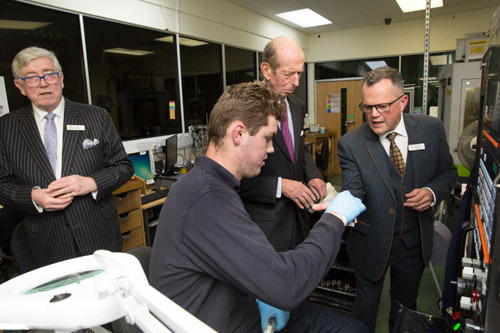 The Duke visited the company as part of a day-long visit to the City. He was accompanied by Simon Topman the Deputy Lord Lieutenant of West Midlands, John Hudson, High Sherrif of West Midlands and The Lord Mayor of Birmingham Ms Anne Underwood. The Group was taken on a tour of the company’s state-of-the-art manufacturing facility by Operations Director Mark Thomas who showed the party the many different processes involved in creating the precious diamond and gem-set jewellery in gold and platinum for which the company is well known. 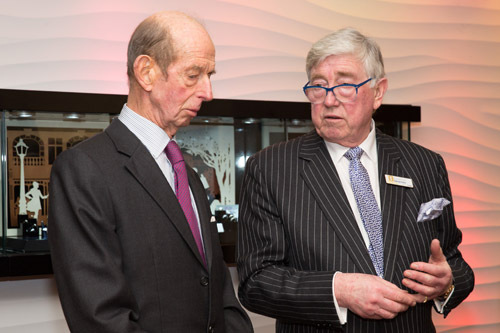 The Duke, who had never previously visited a jewellery manufacturing facility, expressed interest in all the processes which were demonstrated to him. 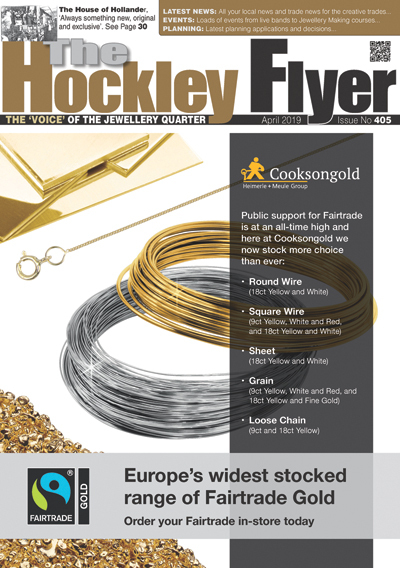 During the tour he was introduced to Stephen Derby who operates a CNC machine within the company’s prize-winning Wedding Ring Cell; Eleanor Inglefield a diamond setter who joined the company as an apprentice some three years ago and Tracey Painter, who works as an Assay Marker within the Group’s in-house Assay Sub-Office which is part of The Assay Office Birmingham by which she is employed. 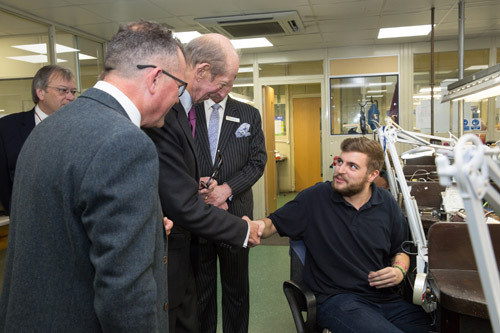 Charles Brooks, a trainee mounter, who is currently just finishing his first year of a Level Two Diploma in Jewellery Manufacture at The British Academy of Jewellery (previously Holt’s Academy) actually shook hands with the Duke and spoke to him about his work. “He asked what I was doing so I explained I was filing the side of a ring after it had been sized. Then I showed him a before and after example. He watched closely and seemed interested. I really wasn’t expecting to be introduced and was just glad that I had cleaned my bench before he arrived,” Brooks said.